1-abc.net Search Engine Confuzer - Search the web automatically for things you would never look for! Did you recognize during the last years that advertisings on websites fit better and better to your needs? Some days ago you searched the web for mountain bikes and now they offer you to buy one. Or you wanted to know something about a foreign country – and very soon they show you advertisings where you can book journeys exactly to that destination. Search engine websites are mainly responsible for most online advertisings nowadays – on nearly every website! So they remember your searches and display their customized banners. Are you scared about this? Do you really want big web companies to control your needs? 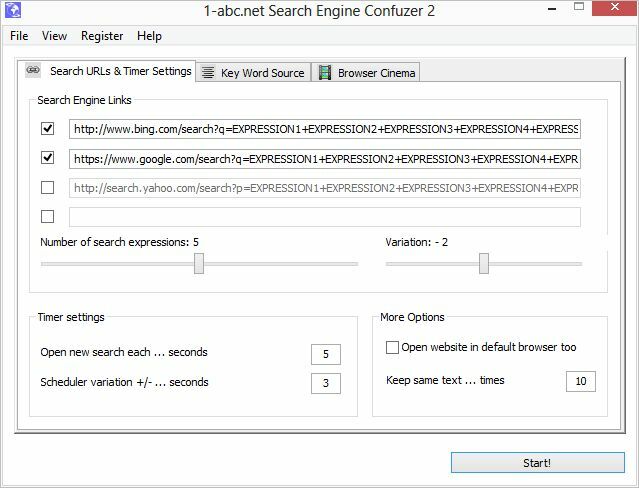 1-abc.net Search Engine Confuzer opens search engine websites automatically with fake and random search expressions you would never search for by your own. So, the more you use this program, the less all these search engine giants will understand what your real interests are – and times with your personalized web banners are hopefully over very soon. Your key words can be constructed from a random Wikipedia article which can be updated as often as you wish. You can also add your own *.txt files from a local drive or another website and the program extracts search expressions from these texts. Up to four search engines can be confuzed. Most used search engines are already added, but it is also possible to confuze other websites aswell which can be social networks, shopping portals or whatever you like. The timer opens your fake searches after a period defined by yourself. You can watch what searches are started on the internal browser cinema or the websites can be started in your default browser additionally. To irritate search engines even more, your random text source can be taken more than one time before it changes and the time period between these search requests can also vary up to 3 minutes – both behaviours make search engine believe even more that a human is asking. 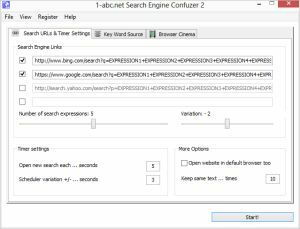 Use 1-abc.net Search Engine Confuzer from time to time and your search requests will not be understood by big advertisers anymore!